Beef Wellington makes an impressive centrepiece for a special dinner. This version keeps the pastry nice and crisp with a layer of crêpes. For the mushroom duxelle, heat the butter and vegetable oil in a frying pan. Once hot, add the chopped shallots and fry, stirring all the time, for two minutes. Tip in the chopped mushrooms. Reduce the heat a little and continue stirring and cooking for about ten minutes until the mushrooms are softened and their liquid has evaporated. Stir in the cream and cook for a further two minutes, then remove from the heat and leave to cool. Place the crêpes onto the work surface, one layer thick, but overlapping - you need to create an area about twice the thickness of the fillet, and about 2.5cm/1in longer at each end. Spread the mushroom duxelle over the crêpes. Lightly pat the fillet with kitchen paper to remove any excess moisture, before placing the meat on top of the duxelle. Carefully roll the side closest to you over the meat encasing it within the crêpes and mushrooms. The crêpes should cover the meat on all sides, but trim off any excess. Place the wrapped fillet onto a sheet of clingfilm and wrap up tightly into a cylinder. Set aside in the fridge until completely cold, about half an hour. Meanwhile for the potato dauphinoise, preheat the oven to 150C/300F/Gas 2. Rub the inside of a deep baking dish or casserole with the raw garlic. Place the sliced potatoes in a bowl and pour over the cream and season with salt and freshly ground black pepper. Stir to coat the potatoes, then lay them evenly in the garlicky baking dish. Cover the dish with foil and bake in the oven for 30 minutes. Remove the foil and cook for a further 20-30 minutes while you prepare the Wellington. Roll the pastry out on a well-floured surface to a rectangle with a thickness of about 3mm. Brush the pastry with beaten egg yolk. Remove the clingfilm from the beef fillet and place onto the middle of the pastry. Wrap the pastry up over the beef fillet. Lightly stretch one edge of the seam so that it is not too thick, then press down firmly to seal. You should be left with a tube that is open at either end. Lightly press the ends of the pastry together using a rolling pin to seal and thin the two pieces. Then with a small knife, trim the edges on each side to form a triangle shape. Brush the triangle of pastry with a little egg and press it up against the side of the Wellington. Repeat with the other side before flipping over so that the Wellington is seam-side down. Place your Wellington onto a baking tray, brush with the remaining egg yolk set aside in the fridge to chill for 5-10 minutes. Increase the oven temperature to 180C/350F/Gas 4 (the dauphinoise should remain in the oven). Remove the Wellington from the fridge and score a pattern of your choice onto the top. Place in the oven with the potatoes dauphinoise and bake for 25 minutes. Remove the Wellington from the oven and leave to rest for 10 minutes. This should give you a perfectly pink finish to your meat. If you prefer it more cooked, then leave in the oven for longer, but you must ensure the meat is well rested. For the Madeira and port reduction, heat the butter in the same pan in which you cooked the beef fillet over a medium heat. Once bubbling, add the shallot and fry for 3-4 minutes, or until softened. Increase the heat and add the port and Madeira. Simmer until the volume of liquid has reduced by half and then add the stock. Reduce again by half. When the sauce has a thick, syrupy consistency, strain through a fine sieve. Stir in the truffle peelings and keep warm until ready to serve. 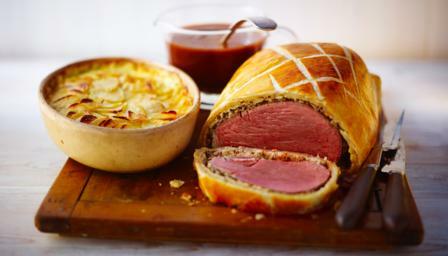 Serve slices of the beef Wellington with the potato dauphinoise alongside and the Madeira and port reduction.